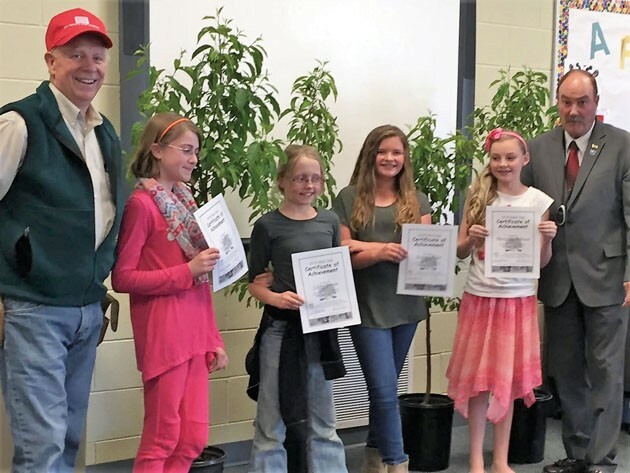 Proud winners of the fifth-grade Arbor Day poster contest are pictured with Gary Fawson (left), and Grantsville Mayor Brent Marshall. Volunteers and organizers unload a large order of trees for pickup by Grantsville citizens. It’s great to see the greening of the valley once again as the weather warms. Sure, we have more than our fair share of false starts when it comes to warmth, but we know it’s on the way. Like I said recently to readers of the Master Gardener newsletter, this is my very favorite time of the year (sorry for dissing you, Christmas time). As winter loses its grip, it’s a real lift to take a drive through the city and country roads and see the green erupting into view. 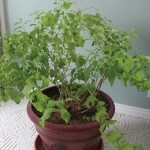 This year, I’m really impatient, and as far as I’m concerned, the greenery can’t come on fast enough. Arbor Day is once again upon us. It’s the last Friday of this month, April 28. 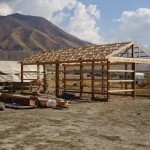 We’ll be having the Tooele celebration a week early — Friday night (April 21) at 6:30 p.m. at the Speirs Farm. This wonderful facility is located at 394 W. 200 South in Tooele. We’ll be honoring past Tooele City Mayor Charlie Roberts. We’ll hear from him, enjoy some musical entertainment, and you’ll even hear from me as I tell you the story of Arbor Day. Join us, will you? As for Grantsville, the celebration will be the following week, on actual Arbor Day, April 28. Grantsville celebrates the event in an imaginative way — I’ll get to that in a moment. Before I do, I want to brag on this historical community a bit. This year is Grantsville’s 150th anniversary, and what a story it’s been. I won’t even attempt to give a history of the town — simply because I’m a relative newcomer (heck, we’ve only been here since 2001), and chances are your knowledge of the roots of this Tooele County community run deeper than mine. What I can tell you is that I’ve seen some great things happen in Grantsville since I made my first drive down its Main Street. When I became a Master Gardener and one of the organizers of the Annual Garden Tour, my radar for the amount of horticultural interest in the valley is always running full scan. And, in the last several years, I’ve seen many folks in Grantsville take deep pride in their yardscapes — both residences and businesses. My friend Rick Hall is the Annual Garden Tour site coordinator — meaning he’s the one that finds great garden locations around the Tooele Valley, and recruits Garden Hosts who agree to have their landscapes be on the Tour. Grantsville has become a mainstay and a community that can always be counted on to have some amazing locations to choose from. The great thing is that there are more and more home owners that are taking a strong interest in creating great yards and outdoor environments. Rick has once again recruited some wonderful locations there in Grantsville that are not to be missed. Some years ago, during our first Garden Tour, we visited the Fawson residence in north Grantsville. We had no idea what we were in for that day or the friendship that would form as a result. When we turned the corner leading into the property, we couldn’t believe our eyes. If I didn’t know better, I’d thought we were in the middle of the southeast, somewhere like Tennessee. The Fawsons have created an oasis in the desert, complete with ponds (artesian wells supply the water), trees, shrubs, flowers, bridges, walkways, pastures, ramadas, a beautiful residence, shop and barn, as well as a massive vegetable garden and orchard. And, if you think the landscape was fantastic, the conversation and camaraderie was even better. That was many years ago, and the Fawsons continue to not only maintain the place, but to add more features and plants each year. This property is a case when “incredible” is an understatement. In fact, I’ve taken to calling the Fawson place the “Fawson Preserve,” it’s that good. It’s so good, that it’s a location on the Garden Tour every year. That’s right, you can expect to see it when the Tour comes around again on June 10. But, I’m getting ahead of myself. Let’s see — where were we? Oh — the imaginative way Grantsville celebrates Arbor Day. You see, Gary Fawson has been at the center of the effort of re-greening Grantsville for over 15 years. Since 2003, Grantsville has earned the prestigious status of “Tree City USA.” Back then, Bryon Anderson was Grantsville’s mayor and he assigned Gary as the Tree Board chairman. Mayor Anderson has since retired, but he and his wife are still active gardeners and are in the midst of restoring their historical home. In fact, they were on the Garden Tour last year. Mayor Anderson’s efforts in this area continue on to this day under the leadership of Mayor Brent Marshall and the city council. 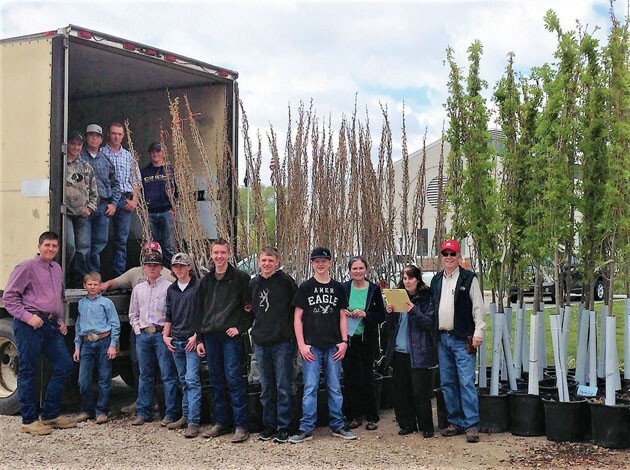 Due to the ongoing support and tree planting efforts required to be a Tree City USA, more than 2,000 large trees have been planted along the streets and in the yards of Grantsville. While Gary Fawson is still the chairman, he credits the whole community for making the tree planting program so successful. Fawson says, “Since 2003, hundreds of residents have purchased trees. 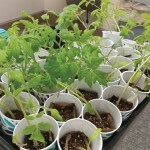 Hundreds of volunteer hours have been donated from Master Gardeners, businesses, Grantsville FFA, and City Shade Tree Board members. Teachers and administrators at the elementary schools have enthusiastically promoted Arbor Day activities. Hundreds of fifth-grade students have drawn tree posters celebrating Arbor Day each spring. Many community groups and neighborhoods, including Eagle Scout project participants, have organized to plant more trees in their parks and common areas. And the great support from city leaders and employees continues every year. So, as Arbor Day approaches, Grantsville will celebrate it by hosting that annual 5th Grade Elementary School Poster Contest, which fosters a love and appreciation for trees and the shady spaces they provide. Winners of those contests take home trees to be planted in their yards. In addition, the city council includes funding in its budget to replace lost historical trees and expansion of the current urban forest of Grantsville. Every year when Arbor Day comes around, Grantsville City offers its citizens a nice incentive to help with the greening effort. For every residence or business owner that is willing to plant two street trees, the city will pay for one. These sizable trees are $75 each, but the program allows a homeowner to buy two trees for placement along the street, for the same price as one, making the cost $37.50 each. There is a limit of two street trees per residence, but citizens can buy as many trees as they would like for placement in their side and back yards, for $75 each. The trees must be preordered, and the deadline is tomorrow, April 21st. There is a nice selection to choose from — all adapted to our area. With proper planting and care, they will do great. Grantsville, you can choose from Bur Oak, Frontier Elm, London Plane, Green Ash, Crab Apple, Linden, Honey Locust, and Canada Red Chokecherry. If you want to see get a full description of the trees and their growth habits and mature heights, visit the Utah Tree Browser at www.treebrowser.org. To obtain an application form and to pre-order your trees, visit www.grantsvilleut.gov/PublicNotice/2017_Application_for_Street_Trees.pdf, or go to Grantsville City Hall. Pay for your tree order, and pick it up on Friday, April 28 from noon-5 p.m. at the City Hall parking lot. Oh, another thing. Gary Fawson informs me that a generous donation from Cargill Salt Company, with the efforts of Mayor Brent Marshall, has also resulted in the addition of hundreds of trees planted in the city’s parks and cemetery expansion over the past two years. Cargill, thanks for your investment in this local community, and Mayor, thanks for your effort in making this happen. Grantsville, keep it up. It’s great to see many more green and shady spots come into being, as well as the investment in new, existing and historical homes. As our valley continues to grow, your green welcome mat will attract new citizens to join the ranks of our neighbors there now and carry on the great traditions you have created. Jay Cooper can be contacted at jay@dirtfarmerjay.com, or you can visit his channel at youtube.com/dirtfarmerjay for videos on the hands-on life of gardening, shop and home skills, culinary arts and landscaping.